Beautiful condominium in the heart of all the action. 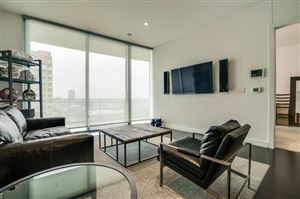 Situated on the 26th floor, the home's floor-to-ceiling windows offer sweeping views of some of Dallas' most iconic neighborhoods. Open-concept living and dining areas, with a gas fireplace, are great for entertaining. Enjoy all the amenities and services that this community has to offer, including a resort-style pool, 24-hour concierge and valet, a fitness facility, and multiple common areas.